One of the two net zero homes: Happy Meadows Courtyard House. There’s “green,” and then there’s GREEN. When the Home Buyers Association of Durham, Orange, and Chatham counties presents its 10th annual Green Home Tour May 2-3 and 9-10, tour-goers will see several houses that are certified“green” because they use less energy, water and natural resources, create less waste, and are generally healthier environments than a traditionally designed and constructed house. Net zero means that these houses produce as much energy as they use. “Passive” refers to their ability to maintain indoor temperature with minimal dependence on active HVAC systems. And, unlike traditionally built houses, these net zero passive houses do not emit any greenhouse gases into the environment. 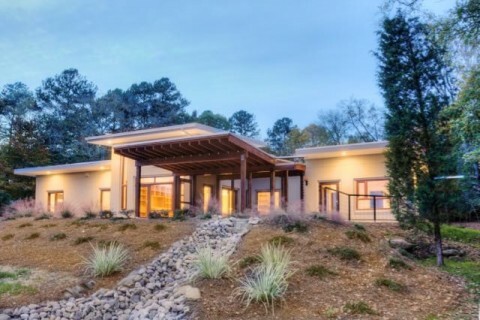 In Chapel Hill, “C6” is the 2289-square-foot, two-bedroom, three-and-a-half bath home of Phil and Velma Helfaer, which they have named the “Happy Meadows Courtyard House” because it also features one of Schechter’s signature design elements: a private courtyard. Kevin Murphy, the owner of Newphire Building and a Certified Passive House Builder, built Happy Meadows. “We wanted to create a home that combined the application of the most up-to-date energy modeling and building science with an artful, modern aesthetic,” he says. Designed to be net positive with the addition of more solar panels in the future, the house will produce enough excess energy to charge an electric car. It’s even third-party certified to the most rigorous energy efficiency standard in the country — Passive House Plus – and follows every EPA recommendation for indoor air quality. 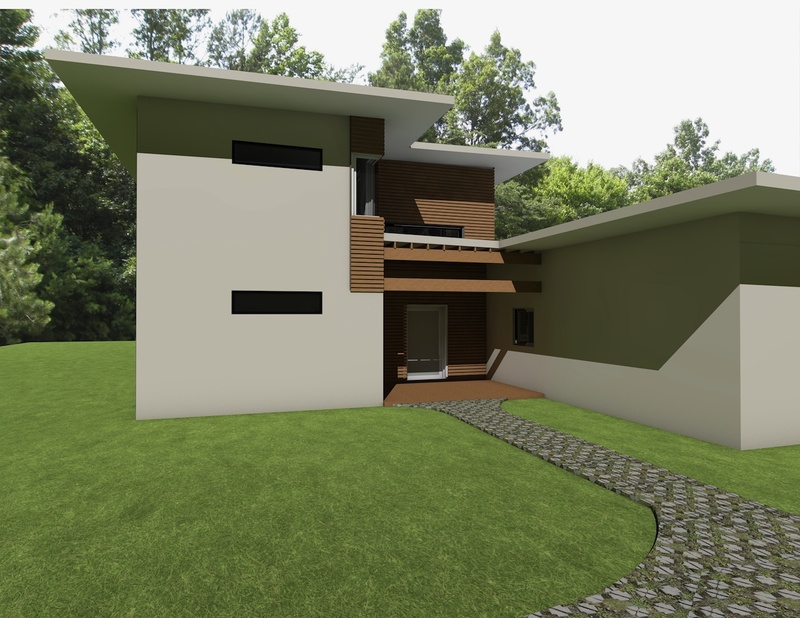 For more details on this house: http://www.acsarchitect.com/#!happy-meadows-courtyard-house/c246b. “C12,” in Pittsboro’s Laughing Brook subdivision, is the home of Pam and Aaron Fleischauer and their young son, Jack. At 1790 square feet with three bedrooms and two baths, this net zero “modern farmhouse” features ultra-low-maintenance concrete exterior walls, 20 solar panels, a tiny HVAC system, and on-demand hot water, among a host of other net zero and passive house elements and details. Bright in the winter and cool and shady in the summer, it was built by Anchorage Building Corp. The Green Home Tour features a diverse group of newly built or remodeled green-certified homes, giving the public an opportunity to see first-hand the renewable energy and advanced green building practices in home design in the three counties. For more information on the tour, go to hbadoc.com. For more information on Arielle Condoret Schechter and the green homes she designs, visit www.acsarchitect.com. 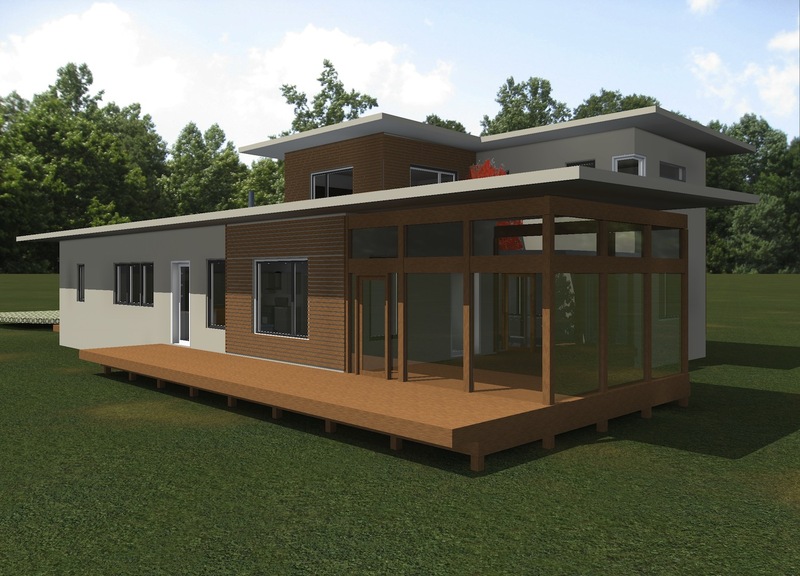 Arielle Condoret Schechter, AIA, is a licensed, registered architect based in Chapel Hill, NC, who specializes in Modernist, energy-efficient buildings with a focus on passive houses, NET ZERO houses, and her new tiny house designs, Micropolis Houses™. She is a lifelong environmentalist and animal advocate who was riding on the green design train long before it became mainstream. She lives in Chapel Hill with her husband, Arnie, and an assortment of foster animals in a Modern house she designed. For more information: www.acsarchitect.com. 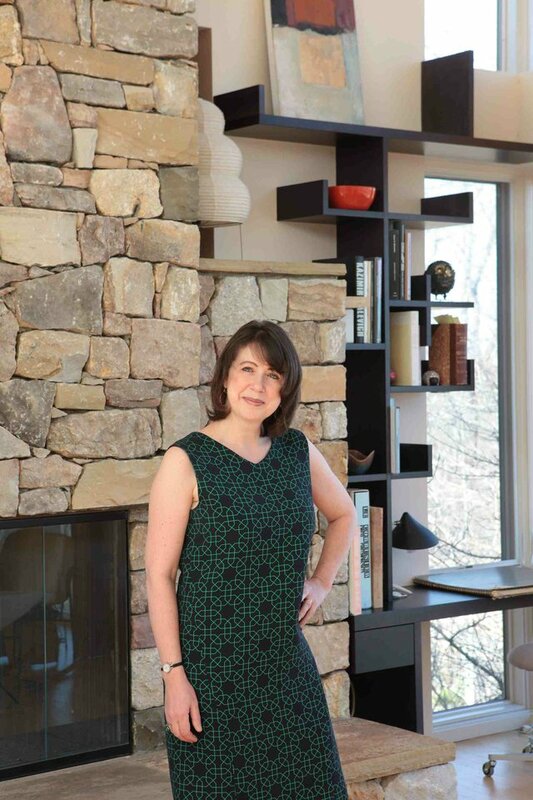 Arielle Condoret Schechter, AIA, in the home she designed for herself and her husband in Chapel Hill. Chapel Hill architect Arielle Schechter, AIA, helps builders embrace high-performance houses. Should homebuilders produce houses that are as “21st century” as cell phones and automobiles? TecHomeBuilder.com believes they should. 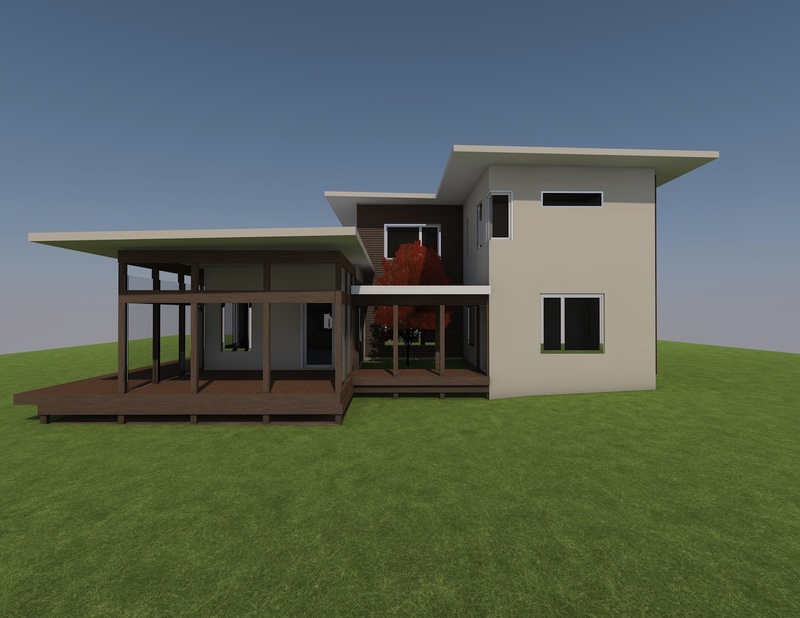 From sustainability technologies to CO2 monitoring, the website’s mission is to help homebuilders and designers learn how to create high-performance houses by including high-tech features both efficiently and profitably. 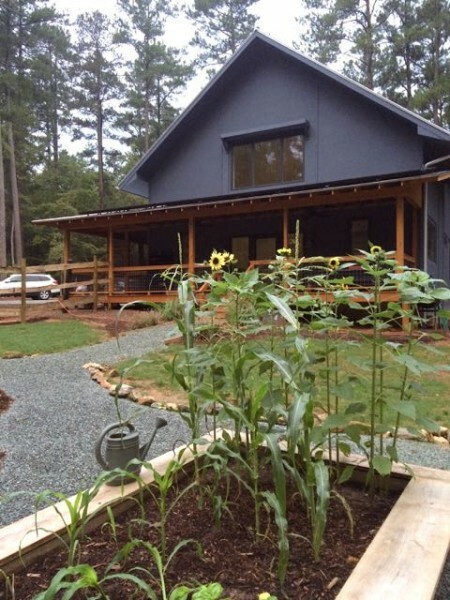 Shechter and custom homebuilder Kevin Murphy of NewPhire Building in Chapel Hill, will discuss the host of “green” strategies and materials they used in “Happy Meadow Courtyard House,” perhaps the greenest single-family house in America, currently completing construction in Chapel Hill. In September, TecHomeBuilder.com posted a story on this uber-green house entitled “Passive House Goes High Tech: The ultimate green home incorporates building science techniques and plenty of energy innovations.” The story listed the many green standards certifications this single-story, 2567-heated-square-foot house has received or will receive once it is completed. Among them are the National Association of Homebuilders Green Builders’ Standard Emerald certification, the standard’s highest rating; and PHIUS Passive House Plus, one of the most difficult certifications to receive. During the webcast, Schechter will help viewers understand that passive homes like Happy Meadow start with attention to such “low-tech” considerations as orientation on the site to maximize natural ventilation from prevailing breezes and natural light; deep roof overhangs to block the high sun in the summer; a special white roof membrane to reflect heat; triple-pane windows; and super-insulation in the roof, walls, and flooring. They also created a wildlife habitat and frog pond on the property. Where passive principles stop technology takes over: She and Murphy will discuss the green technologies they employed — including a photovoltaic array, geothermal heating and cooling, a rainwater capture system, and the “CERV” ventilation system, to name only a few — to make this house net zero for energy use and perhaps net positive when it produces more energy than it uses. They will also explain how up-front investments in sustainable materials and green technologies reduces a high-performance house’s energy consumption and costs to a fraction of that of a conventional house. Viewing the “Riding The Red Hot Healthy Home Trend” webcast requires preregistration (at no cost). Go to www.techomebuilder.com, click on “Events,” scroll down to “Webcasts,” then click on “Register for the Webcast” under the name of the show. TecHomeBuilder.com is a primary resource for homebuilders who want to make the inclusion of high-tech features in the homes they build efficient and profitable, from energy, lighting and HVAC and IAQ to advanced appliances, electronics, and connectivity. TecHomeBuilder.com provides education, application strategies, and inspiration. For more information: www.techomebuilder.com.